that is shocking, thanks for the info man. Is this pointing a slow death to Bitcoin ? Kind of merger of Bitcoin and BCH. Will it increase the supply of Bitcoin from 21M to many more ? No.... it's more like you have 1 son (bitcoin core) and 1 step son (bitcoin cash) then you stop supporting your son and give all your support to your step son because you think that your step son is your real son. 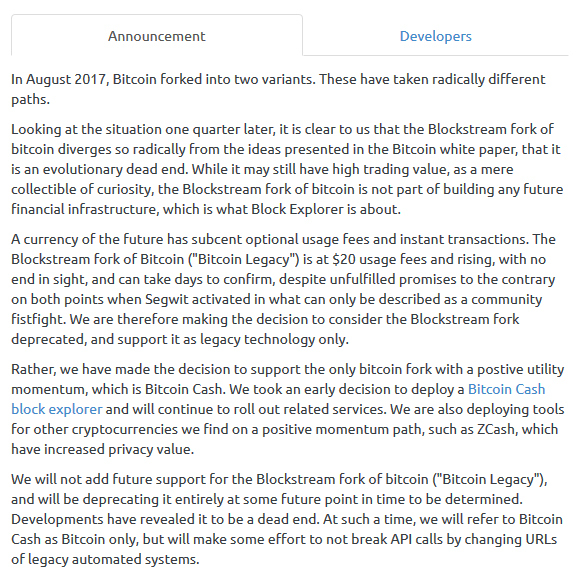 There are such diverging views on Bitcoin and Bitcoin cash. From an investment perspective, I think diversification is the only way to mitigate risk. This post has received a 16.57 % upvote, thanks to: @sonny.dharmawan. You got a 0.81% upvote from @upme requested by: @sonny.dharmawan. Thank you @sonny.dharmawan for making a transfer to me for an upvote of 5.33% on this post! Half of your bid goes to @budgets which funds growth projects for Steem like our top 25 posts on Steem! The other half helps holders of Steem power earn about 60% APR on a delegation to me! For help, will you please visit https://jerrybanfield.com/contact/ because I check my discord server daily? To learn more about Steem, will you please use http://steem.guide/ because this URL forwards to my most recently updated complete Steem tutorial? This post has received gratitude of 0.72 % from @appreciator thanks to: @sonny.dharmawan. You got a 3.98% upvote from @postpromoter courtesy of @sonny.dharmawan! Want to promote your posts too? Check out the Steem Bot Tracker website for more info. If you would like to support development of @postpromoter and the bot tracker please vote for @yabapmatt for witness! This post has received a 8.37 % upvote from @aksdwi thanks to: @sonny.dharmawan. You got upvoted from @adriatik bot! Thank you to you for using our service. We really hope this will hope to promote your quality content! You got a 20.51% upvote from @ipromote courtesy of @sonny.dharmawan! @sonny.dharmawan, sorry to see you have less Steem Power. Congratulations @sonny.dharmawan! You have received a personal award!